After a week of on and off rainy days, we took advantage of this glorious, Sunday sunshine and headed to the family’s summer home in Saint-Georges-de-Didonne. What a beautiful day it was! Saint Georges is a quaint little town. It is charming, friendly, and busy! Even though we were well into the month of September, there was a buzz felt throughout the town square and along the beach. “Rainy day fever” was being stripped from our minds by the fabulous weather. We began our day walking past the center square, which is adjacent to the church. The church of Saint- Georges was originally constructed in the 12th century, but most of what is left now dates to the 19th century. We continued on to the marché to pick up a few items for our evening dinner: fresh oysters, “crevettes roses”(little pink shrimp), some bulots (similar to snails) and “la Jonchée” cheese. Check back in a few days as I will be writing a special post on this unique, rare cheese. Following our little stroll, we decided to have lunch at a tapas restaurant close to the house. The owner and chef is from Spain. She served up some traditional tapas for our starter, then continued to delight our taste buds with our main dishes. I choses the “plancha” of seafood…a must with the fresh variety one can find daily in this area. A bottle of rosé from the Vendée region, located just a bit north of the Charente-Maritime, was the perfect companion. We ended our meal with creamy ice cream…my choice was the “fleur de sel” caramel! Yum!! We had our coffee and cognac back at the house. With lunch completed, and dinner purchases safely in the refrigerator, it was time to get outside and hit the beach. After circling back towards the main beachfront, I continued walking in the opposite direction for a couple of kilometers. As I reach the far end of the beach I decided to make my return walk barefoot through the water. In spite of walking over 5 miles that afternoon, I felt energized, yet relaxed. Fresh sea air, warmth from the sun, a satisfied stomach after our scrumptious lunch…a truly perfect day all around. 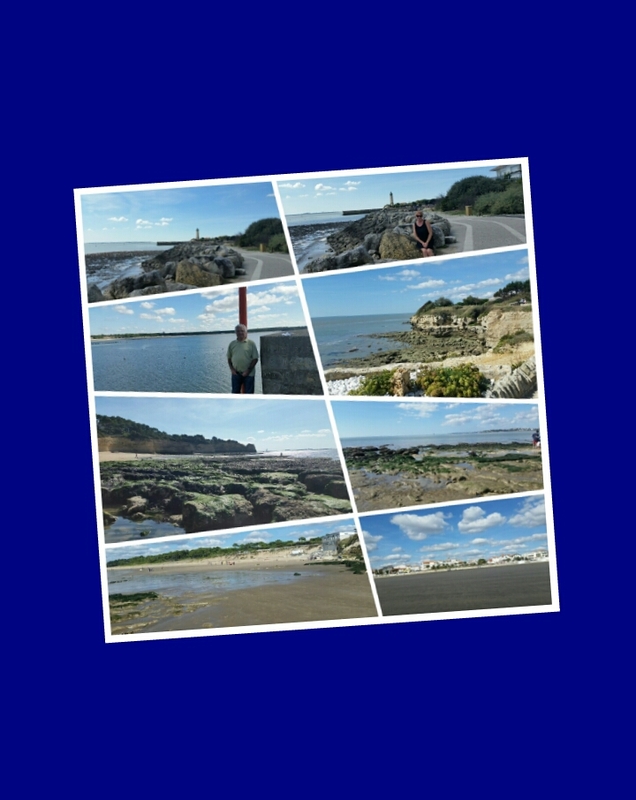 This entry was posted in #Charente-Maritime, #France, #Lighthouses, #Saint-Georges-de-Didonne, #Travel, Cheese and Wine, Rosé Wine and tagged #Bulots, #Crevettes Roses, #La Cordouan Lighthouse, #La Jonchée, #Louis de Foix, #Oysters, #Royan, #Vendée, #Wikipedia. Bookmark the permalink.